Pretty shells and sporty ribbed stripes don't always make a good match. Even though it's faster (technically) to ladder down to a mistake stitch and weave it back up correctly, when the yarn is fabulous it's more fun to rip back and knit over. 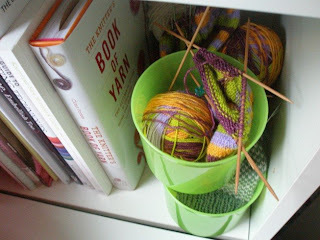 Little green Tupperware cylinder tubs make really, really good knitting caddies for mittens and socks. They even stack nicely, considering all those needles sticking up out of them. Socks are more work than mittens, but if you're using really awesome sock yarn you can get excited about them all over again by trying them on. Two bad things to do the night before a tough day: staying up late to read books, and staying up late to knit one more row. If I can turn a sock heel, there isn't much knitwise I can't do. Sorry the ribs and shells didn't work together- I thought that they would. And yes, you can knit anything! That thumb technique on the new mittens I'm doing though... soooo easy!